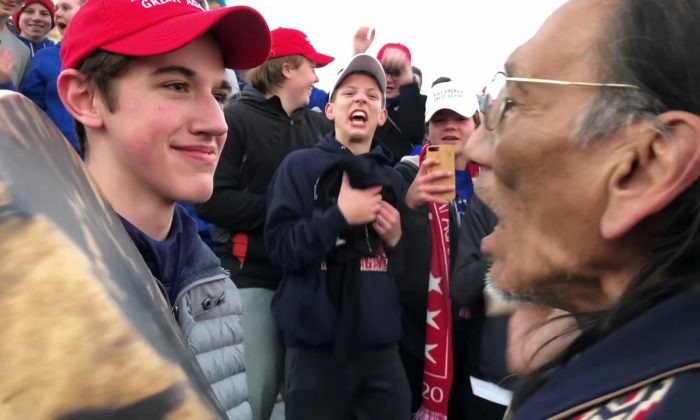 After multiple media outlets misreported an incident in Washington last week involving students from Covington Catholic High School in Kentucky, a lawyer who represents the students’ families said they may pursue a libel lawsuit against those who unfairly disparaged the students, especially those who didn’t retract their comments. 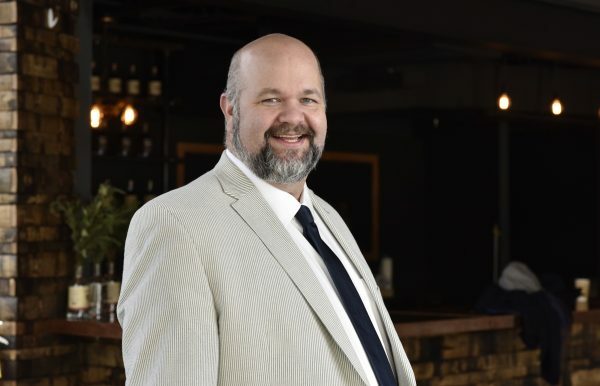 “Anyone who doesn’t correct and retract” libelous stories related to an encounter near the Lincoln Memorial would face a lawsuit, Los Angeles-based trial lawyer Robert Barnes told PJMedia. Corrections indicating that “a more complex picture has emerged” may not be enough, he said. Barnes confirmed to The Epoch Times that he represents the families, who “don’t want to, but feel it necessary” to pursue the libel charges. He said both media members and celebrities that targeted the students may be named as defendants. “Many lied, when honest reporting showed truth,” he said via email. Barnes expressed confidence in the strength of his case. It’s easier for private citizens to raise libel charges against a person who publishes false claims about them. Private citizens only need to prove negligence, such as failure to fact check, on the part of the publisher. Public figures, on the other hand, need to prove “actual malice” to claim libel, which means knowing the statement is false or acting with reckless disregard of whether it was false or not. Barnes said he will likely bring the case “as a class claim to preserve the maximum amount of anonymity” for his clients. The potential lawsuit would stem from a slew of reports about an encounter between the high schoolers, a group of Black Hebrew Israelites (BHI), and several Native Americans right after the Jan. 18 March for Life ended in Washington. Based on multiple videos of the incident posted online, dozens of students of the Catholic all-male private school gathered near the Lincoln Memorial, waiting for their bus after attending the anti-abortion march. Before long, the students became the target of insults and slurs from several BHI members, who held an event nearby on the street. BHI were called “a black supremacist group” in a 1999 FBI document (pdf). At least some of their subgroups are known for fiery rhetoric against whites and others. The students, some of whom wore hats with President Donald Trump’s campaign slogan, “Make America Great Again” (MAGA), responded by drowning out the insults by school chants, laughs, and cheers. After a while, a few Native American activists, who had just concluded an event nearby and were beating small drums, approached the students and made their way into the midst of the crowd. The students continued to cheer while jumping and clapping to the drumbeat. 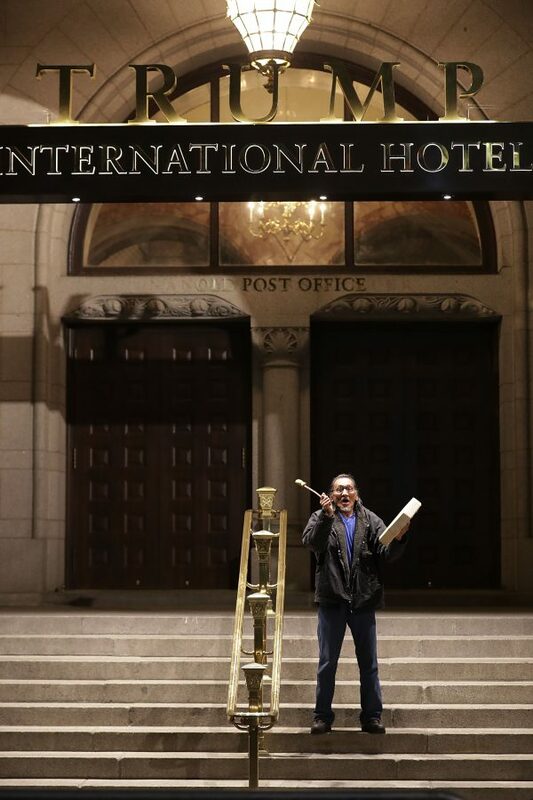 One of the Native American men, Nathan Phillips, 64, approached one of the students and came so close as to beat the drum just inches from the student’s face. The student responded by silently looking at the Native American man and smiling. “What’s going on?” another student is heard asking. As he continued to repeat this point, several of the students started to boo him and some offered comments of their own. “That’s your message,” one student said. “That’s right,” the BHI speaker replied. At least two times, an adult who seemed to be chaperoning the students intervened and told the students to step further back from the BHI members. The Native Americans seemed to leave after several minutes. The students left shortly afterward. A number of media outlets covered the incident, but failed to include key facts. They also, apparently, went along with an inaccurate portrayal of the events by Phillips, despite the presence of videos online contradicting him. Phillips called the teens “beasts” who were attacking their “prey”—the BHI members, Detroit Free Press reported. The videos show no such thing. He also claimed the teens surrounded and threatened him. Multiple videos show it was Phillips who approached the students. Phillips also claimed they chanted “build the wall,” a common slogan in support of Trump’s promise to secure the southern border with a physical barrier. The videos don’t appear to show such a chant. Many media also initially failed to report the teens started to chant and cheer in response to the BHI members’ offensive comments. The resulting reports led many readers to believe the students mocked the Native American man out of racial prejudice. The reports triggered a deluge of angry responses online. Many social-media users with sizable followings jumped on the bandwagon and vilified the teens, some calling for their expulsion, harassment, harm, and in some cases, even death. “Name these kids. I want NAMES. Shame them,” actress and writer Kathy Griffin said in a Jan. 20 tweet. She doesn’t seem inclined to walk back her statement. 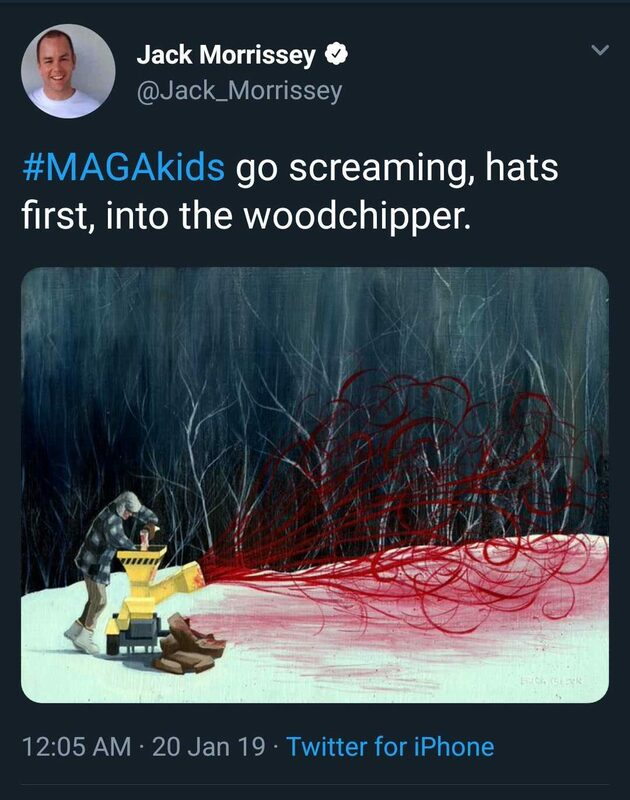 Movie producer Jack Morrissey posted a picture of a man stuffing a human body into a blood-spewing woodchipper with a comment, “#MAGAkids go screaming, hats first, into the woodchipper.” He’s since made his account private. He has since been fired from his post-production supervisor job at INE Entertainment, TheWrap reported. In a Jan. 20 tweet, Barnes offered to represent the Covington teens pro bono. The lawyer emerged in national media coverage more than a decade ago when he helped clear Wesley Snipes of more serious tax-evasion charges. The actor still served three years for additional misdemeanor charges.